Tenaya Hurst is a Rogue Maker who offers workshops for kids and adults in sewing with electronics, soldering, and programming. 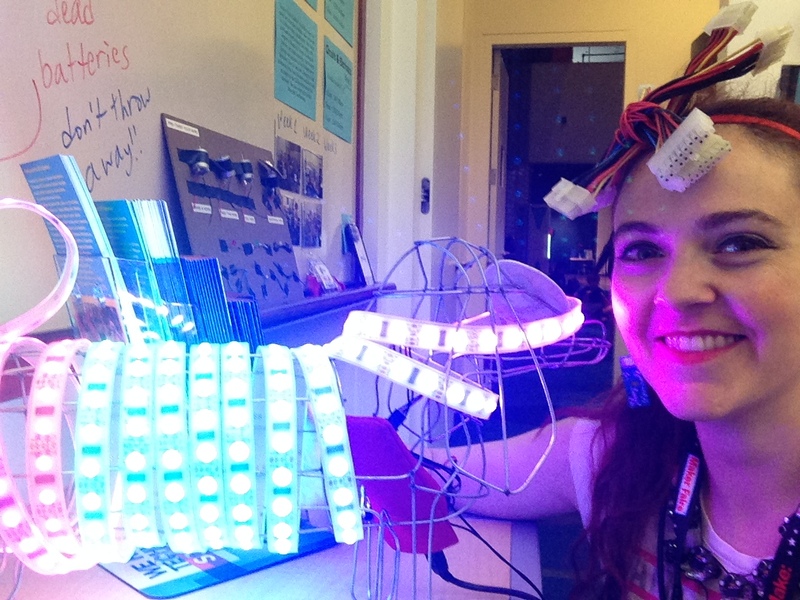 She showcases her wearable tech and celebrates her students in maker song music videos. Self taught, enthusiastic, fearless, she also holds a position as education accounts manager and evangelist with dog hunter LLC, creators of the Arduino Yun and Linino microcontrollers for IoT. 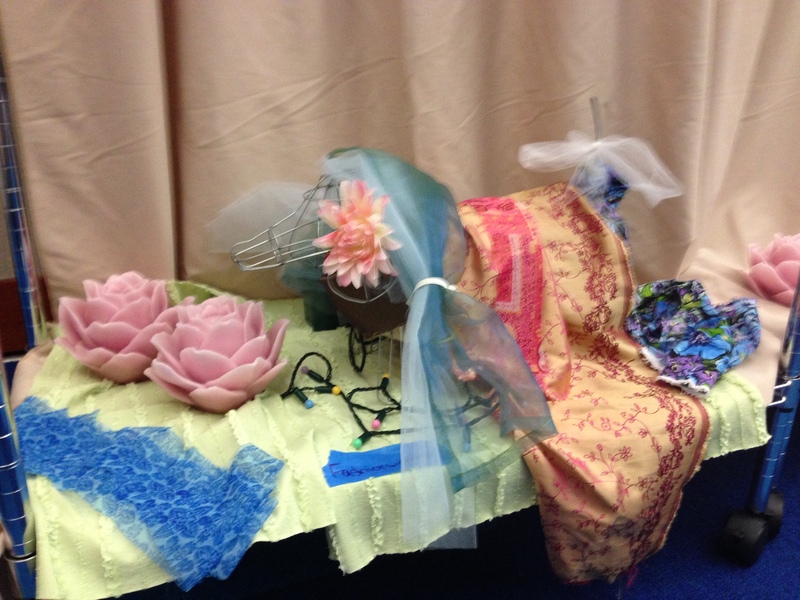 I was teaching and facilitating a class with Workshop Weekend at Tech Liminal in Oakland, CA. We provide a weekend for makers to consult with electrical engineers, software engineers, and teachers like me, to better understand electronics. One of our makers was leading a class in LED strips and I was immediately enthralled. We had a big 5 meter strip going down the middle of our long table and we saw all the demonstrations of the way we could change the patterns using Arduino IDE – a programming environment. I couldn’t wait to show my students at Galileo’s Tech Summer Camps at the Tech Museum of Innovation. I teach 3 classes there – Circuits & Electronics, Wearable Tech, and Maker Studio. The problem I faced was how to display the LED strip to effectively show off the patterns, but also make the display portable. When I was a little kid, I played with Light Bright, so this would be a 3D programmable version! Also since I was a kid, I’ve loved dachshunds or wiener dogs. They’re simply the best. Sure, I have been sad that I can’t bring my dog, Woodchuck, to my various workshops. Obviously, I want to be focused on making and teaching, not my dog, but I still feel bad that he must be left at home. So that influenced the solution to my problem. 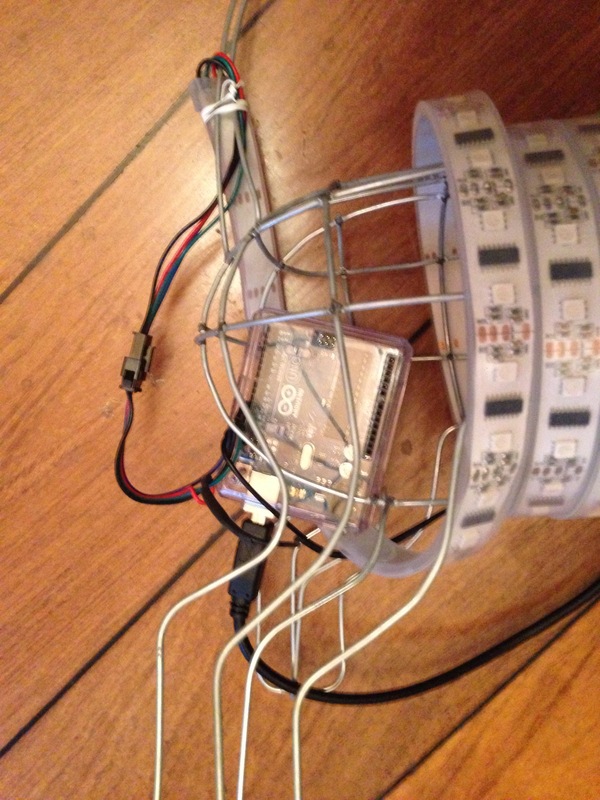 I wanted something that would remind me of Woodchuck and some way to display my LED strip…the ideas were swirling! At the same time, a friend of mine was designing his garden and started getting into topiary shapes. Also I happen to just see the amazing documentary “A Man Named Pearl” about a very inspiring artist who happens to use trees and shrubs as his medium. Finally, I happened upon Etsy and found the answer – exactly what I needed! A topiary shape of a dachshund, custom made by Gina Moll of Hollywood, Florida. The RGB LED strip fits perfectly around the little dachshund allowing for fun rainbow patterns, color chasing functions, Cheshire cat swirls, and more. I tooled around with Arduweenie for months and he made a few appearances in my classrooms. It wasn’t until an Open Make event at the Tech Museum of Innovation in April 2014, that Arduweenie made the leap to true Twitter fame. A photo taken by Rebekah and tweeted by Prinda got the attention of Atmel’s V.P. of Marketing, Sander Arts. After all, every Arduino features an Atmel ATmega328 chip. 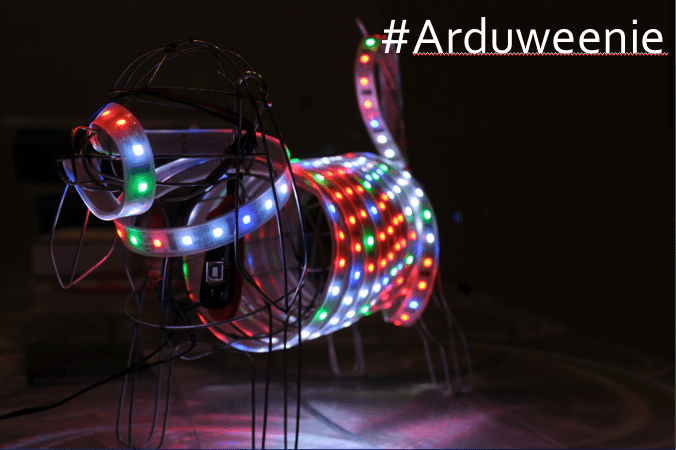 #Arduweenie features an Arduino Uno. Also in April, I hosted The Tech Challenge, a large scale engineering challenge. Sander Arts was a special guest, but I didn’t get to meet him that day – as host I was on stage the entire event introducing the teams. It later all came together at Maker Faire San Mateo 2014 when my Linino.org exhibition booth was adjacent to the Atmel-Arduino installation. Sander was very kind and came to meet me in person with his team. I was so graciously included in 3 photos on Atmel’s blog about the Maker Faire – and #Arduweenie made it in 2 photos as well! Since becoming famous, #Arduweenie has delighted students in my classrooms from San Jose to Oakland, Santa Rosa to San Francisco. Now #Arduweenie makes a triumphant leap to the New York City Maker Faire 2014. You can find us in the Electronics Tent EP40 on September 20th and 21st.